There could be no topic more significant to history than how people have fed, clothed and sheltered themselves and how they have obtained this food, clothing and shelter, and after a year in which a book named Capital in the Twenty-First Century has sold 250,000 copies, there could be no topic more timely than the history of capitalism. Neal and Williamson’s collection is wide-ranging. The first volume, covering up to 1848, contains studies of market relationships amongst the pre-modern economies of Babylonia (Michael Jursa), Greece (Alain Bresson), Rome (Willem M. Jongman), the Silk Road trading bloc (Étienne de la Vassière), China (R. B. Wong), India (Tirthankar Roy), the Middle East (Şevket Pamuk), mediaeval Europe (Karl Gunnar Persson) Italy (Luciano Pezzolo), Latin America (Richard Salvucci), Africa (Morten Jerven), and pre-colonial Northern America (Ann M. Carlos and Frank D. Lewis). 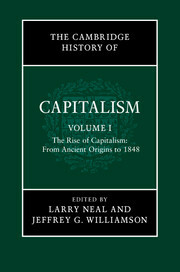 The chronological structure is maintained with studies of the Low Countries (Oscar Gelderblom and Joost Jonker), a comparison of state forms in England, Europe and Asia (Patrick Karl O’Brien), and chapters on industrialisation in Britain and Europe (C. Knick Harley), on the dynamic early capitalism of the United States (Jeremy Atack), and on the ideas of classical political economy (José Luís Cardoso). The writing is generally lively, and the detail of the supportive argument is frequently compelling. To take just two examples of many that could be chosen: in volume one, Alain Bresson’s chapter on the ancient Greek economy uses shipwreck data to illustrate the decline of the Mediterranean economy in the Christian era. The number of wrecks per century increases seven-fold between about 700 BCE and 100 BCE before declining to an equal extent between 100 CE and 700 CE. There are some problems with the evidence of the seemingly catastrophic downturn in trade and prosperity in the Christian era (classical amphorae from shipwrecks are more likely to survive than wooden barrels): the compelling point is rather the previous, dramatic increase in Mediterranean trade. In volume two, Robert Attlee illustrates the relative weight of different economies in global manufacturing with a graph showing (amongst other things) the proportion of world manufacturing taking place in India and China: which fell from 58 per cent in 1750, to just 4 per cent in 1950, albeit with recovery in the last two decades. Almost every chapter has a similar moment when the typical, informed reader will stop and pause and express a silent thanks to the author for the quality of the detail. At times in the second volume contributors do struggle with the difficulty of writing compellingly about every country in the world over a timescale of 150 years or so. That said, Allen makes a good job of dismissing the contemporary cliché that growth correlates to an absence of state intervention, while Frederico is right to point out the resilience of small-scale agriculture (in contrast to the best predictions of 120 years ago), and Austin’s chapter on the relationship between capitalism and the colonies is surely right as to the differences between British and American-style colonialism, the variety of settler projects, and the costs with which post-1945 administrators associated their no-longer-loved empires. An important weakness of the first volume is the editors’ and the contributors’ lack of a coherent definition of capitalism. In the introduction Larry Neal defines capitalism by four common characteristics: private property rights; contracts enforceable by third parties; markets with responsive prices; and supportive governments. This analysis is not explanatory, and in so far as it purports to be descriptive it is unconvincing. What contracts in contemporary capitalist Britain are enforceable by third parties? (The lawyer’s answer is: very few). What would a market without responsive prices look like? It is hard to see how it could still be ‘a market’. The operative part of this definition appears to be in the relationship between the first and fourth characteristics – i.e. capitalist governments are those which support private property rights – but not only does this involve tautology (capitalist states are ones which encourage capitalism) the definition also hinders the historian in terms of what a good definition ought to do, i.e. distinguish between marginal cases. Did the courtiers of Tudor England support property rights? In so far as they could, they did. The absences are clear only once state policy is located in its total social context. Did the government of Nazi Germany promote private property rights? Yes, again, but only if it is understood that the holding of capital remained sacrosanct to a much greater extent than the position of capital’s personal holders. Neal’s definition suggests that capitalism operates primarily on the national terrain, which after the initial breakthrough in Holland and Great Britain, is far from apparent. Was late Tsarist Russia capitalist? If state policy was addressed in isolation from the world market the answer might well be no. If the answer is seen from Russia’s position within a world system, the answer would surely be yes: its investments, trade and profits were shaped by a world market – only food production carried the memory of a pre-capitalist era. Because the book has no guiding definition of capitalism, chapters are chosen which are interesting and well-informed but whose relevance to the book is questionable. If, as a minority of contributors seem to believe, a characteristic of capitalism has been the reliance of its most dynamic sectors on free (i.e. non-slave) labour, then, the appropriate place for a historical volume focussing on origins (like the editors’ volume one), would surely be on a) those societies in which this transition took place early, and b) those other societies, which had been at a similar level of development but which did not see a transition to free labour. Chapters six to 12 of the first volume broadly correspond to this schema. But they are bookended on each side with chapters which tell us, in effect, that there was an economy and there were markets in ancient Babylonia, Greece, Rome, etc. At this point, you feel that the editors of the collection have drifted into allowing their book to be a General History of the World Economy, rather than what it purports to be, a history of capitalism. The imprecision of the editors’ guiding hand is also seen in the omission of any chapter which answers directly the historian’s question: why did capitalism emerge in Britain? This reader was left feeling rather like the observer of a complicated archery competition, in which the most talented archers were instructed to aim only for the outside blue and black rings but to miss repeatedly the golden rings in the middle. A series of contributors come close to addressing the breakthrough, before leaving it in effect to someone else. Persson’s chapter on coercion makes some good points about the early decline of manorialism in Europe west of Germany, Gelderblom and Jonker’s vivid account of the marketisation of the Low Countries cries out for a parallel piece looking at Britain, and O’Brien has some good points to make about the stability of post-Cromwellian naval policy for decades afterwards and its contribution to England’s later naval hegemony. In his chapter Harley argues, plausibly, that British industrialization was based on quite narrow technical advantages, and refers with a brief backwards look to Brenner’s famous thesis about the early adoption of market relationships in British agriculture. At this point, he is turning back to arguments originally applied to a period 200 years before the bulk of his material, and he devotes just a page to expounding Brenner’s argument. Brenner, or the alternative theories looking for capitalism’s origins in developments in the towns, should have been at the heart of the first volume, and it is to the collection’s weakness that no chapter addresses them fully.